Healthcare programs are Family Health Ministries’ primary focus. FHM provides a variety of programs including women’s and children’s healthcare. We are best known for our cervical cancer prevention and research programs. 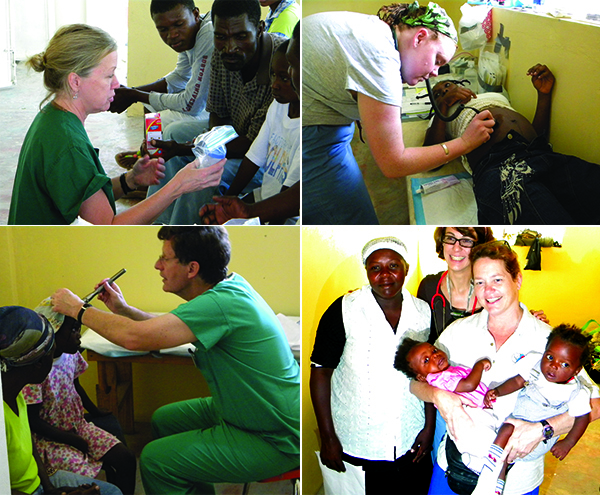 The Blanchard Clinic in Port-au-Prince was opened in 2006 and provides women’s health services to a community considered a part of Cite Soleil. Services include general GYN, prenatal and preventive health services. In 2008, the second floor of the clinic was opened and cervical cancer screening was added to the list of services. This clinic is responsible for screening most of the 20,000 women screened to date by Family Health Ministries. The Leogane Family Health Center will be a preventative health care complex serving those without access to basic healthcare needs. In addition to providing patient-care, the center will be a teaching and research facility for American and Haitian staff to work together on improving health outcomes. The vision for this health center was born out of the need in the community for basic women’s healthcare services. Pregnancy and delivery are two of the greatest health risks during a woman’s life. In the United States, approximately 1 in 4 pregnancies have a complication serious enough to require hospitalization. American women have about a 1 in 2,800 lifetime risk of dying in childbirth. In contrast, in low resource countries like Haiti, a woman’s lifetime risk of dying can be as high as 1 in 16. All women around the world begin their pregnancies with the same hopes and dreams for their unborn children, but women who do not have access to basic healthcare face a very different set of risks.The next phase of the project is to build the Leogane Surgical Center which will provide emergency services such as c-sections. The Carmelle Voltaire Women’s Health Center opened in early 2016 in the rural mountain community of Tom Gato. Construction of the project was accomplished in partnership with the Building Goodness Foundation. This facility is staffed by a part-time OB/GYN, highly skilled nurses and skilled birth attendants. This is the only facility in the area providing comprehensive women’s health services. Women needing advanced emergency care will be transported to the surgical facility in Leogane.